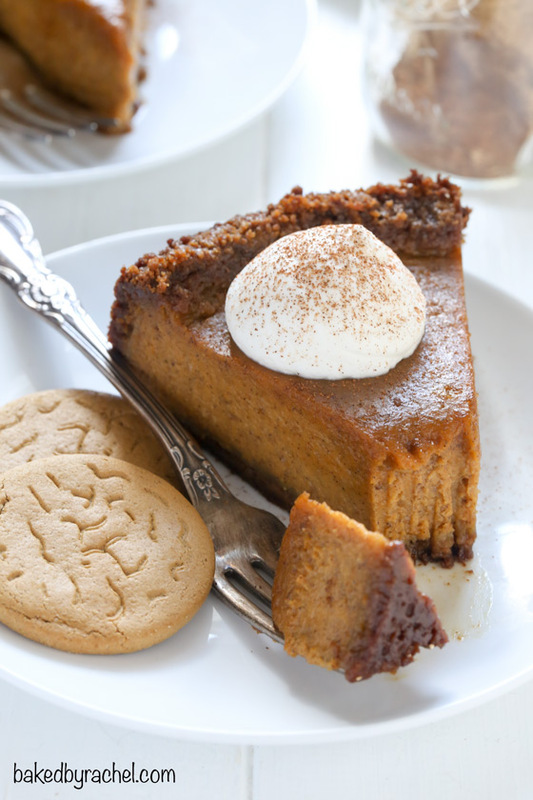 Creamy deep dish pumpkin pie with a flavorful gingersnap crust. A perfect addition to your Thanksgiving dessert table. And just like that… it’s November. It really felt like the strangest weekend ever, what with Halloween and daylights savings time happening back to back. I did manage to sleep in, but only until my regular time so in a way I did sleep in but I didn’t… if that makes sense. And now, Christmas displays are literally everywhere and holiday music is playing. Not here of course. I promise I’m swearing it all off until later in the month. I’ll eye stuff, maybe buy stuff, but no listening, watching or decorating anything Christmas-y. It’s kind of crazy how one day it’s Halloween and everyone is sharing their costumes and favorite candy. Then mere hours later the same people are suddenly Christmas obsessed. Too much. Too quick for me. One upside to it being November is that we got a great deal on a pumpkin! I figure sales are highest before the holiday, because everyone wants a pumpkin to carve. And now the sales on pumpkins likely dwindle and farms need to get rid of their stock before the month is over. Makes total sense. And it’s perfect timing for a pumpkin project at school! Win win in my eyes! Another huge upside to it being November… pie! I have a serious love for pie. Since Thanksgiving is only a few short weeks away, it’s a great time to start thinking about what you want to make. This deep dish pumpkin pie should definitely be on the menu! Year to year, I flip flop back and forth between making cheesecake and pie. This year, clearly it’s pie. 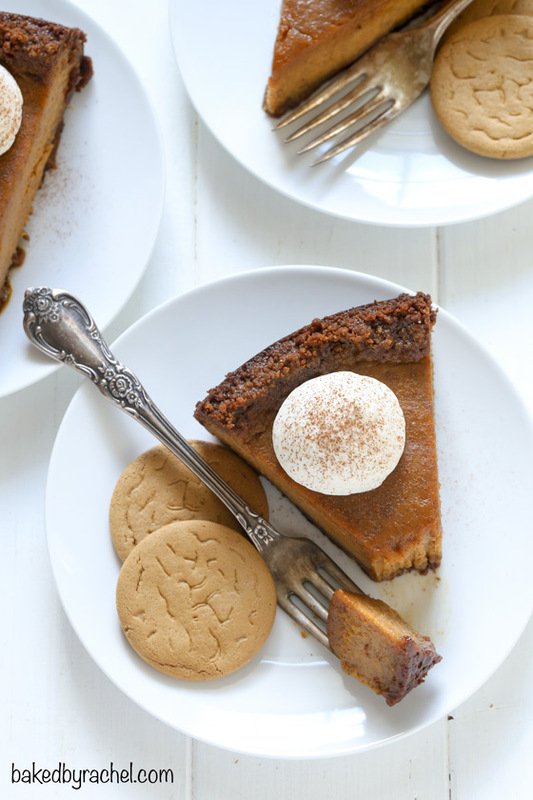 Deep dish pumpkin pie with a spiced gingersnap crust! The absolute best of both worlds… the depth and crust of your favorite cheesecake but with the amazing flavor and creaminess of a pie! 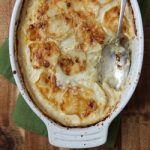 An absolute must make and a perfect addition to your Thanksgiving table! 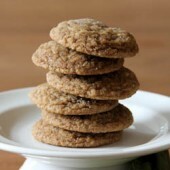 Process gingersnap cookies until only fine crumbs remain. 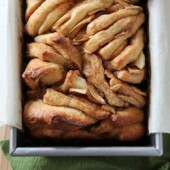 Mix in melted butter, sugar and cinnamon. Press cookie crust onto the bottom and 1 1/2 to 2-inches up the sides of a springform pan. Crust should be roughly 1/4-inch thick. In a large bowl or stand mixer, beat together pumpkin puree with sugars, salt and spices. Slowly add evaporated milk, mixing on low, followed by vanilla. Add one egg at a time, mixing until fully incorporated and no streaks remain. Pour pumpkin mixture into prepared crust. Bake for 75 minutes or until the center slightly jiggles. Cool completely overnight. Serves roughly 6-8, yields 1: 9-inch pie. Pumpkin pie is awesome, but deep dish is even better! When we were at Target on Friday buying Halloween candy they were already clearing it out and making more room for Christmas, kind of sad and slightly annoying. 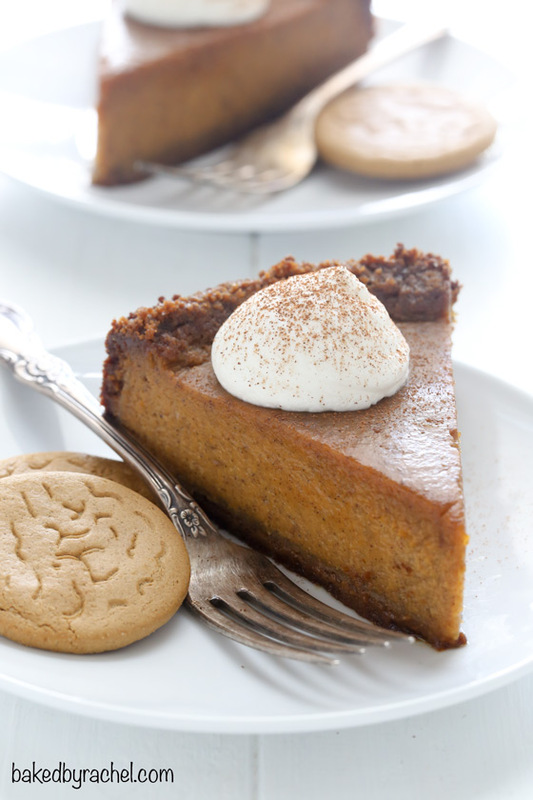 The gingersnap crust on the pumpkin pie sounds phenomenal, I definitely want to try it this year! I’m honestly not surprised but they should at least wait a day before transitioning… or one would hope! Ooo! Gorgeous! I can imagine digging a fork into your deep-dish version! Looks amazing, and I’m with you on the Halloween-to-Christmas switch – ugh! It’s crazy how they push the holidays the way they do!! Although I must confess we listen to Christmas music off and on throughout the year. 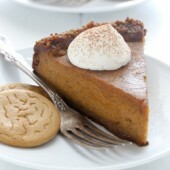 I have always wanted to try pumpkin with gingersnap, looks delicious!! Absolutely LOVE pumpkin pie – we don’t really eat it here in the UK, which is such a shame!! So I will definately be trying this one! I never thought of baking pie in a springform pan but I love the results you got. And that crust! This was my first pumpkin pie ever and I really liked it! 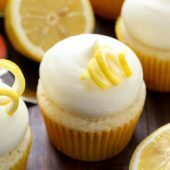 :) Great recipe. So glad you enjoyed it! Thanks so much for sharing, Ilona! 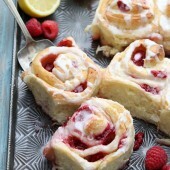 This recipe sounds delicious, but I have one question – what size springform pan? A standard 10-inch springform pan should be used. Do you think this would work in a muffin tin with paper liners? I am thinking it may be easier for me to transport on T-day! I haven’t made this into mini portions and cannot be sure how well it will work with the current amounts. You’d be doing so at your own risk. But I do wish you the best of luck with it! 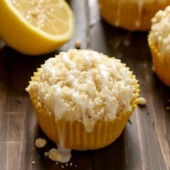 Love the idea of baking in a springform when using a crumb crust. Pumpkin and Ginger Snaps are delicious together! As an alternative, have you ever used graham crackers? 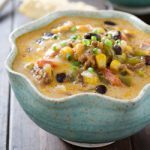 I’m guessing a straight substitution would work just fine in your recipe, don’t you think? Thanks and Happy Thanksgiving! You could definitely substitute graham crackers. Enjoy! I see you said to use a 10″ springform pan above, despite the recipe yield saying 1-9″ pie. At what point can you remove the form? When cooled? Will the pie still keep the shape? Or should you not remove the form at all? And what is sprinkled on the whipped cream in the photo? 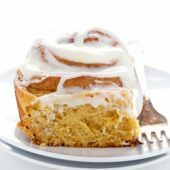 Cinnamon? Whichever size you have will work fine. It will keep it’s shape but should not be removed from the pan until it has chilled thoroughly, at least overnight. After cooled, do you store this in the fridge or at room temp? Looks delicious! Going to try it for a family Thanksgiving celebration on Sunday. Hi Rachel! I don’t have a springform pan. Would this work in a regular deep dish pie plate? Thanks for such a quick reply, Rachel! The pie plate I have should work just fine then. :) Happy Thanksgiving! Should I line or grease the pan? In most cases, without greasing should be fine. Thankyou for this amazing recipe! I was Leary at first, baking it for 75 min. But, it turned out perfect. The only thing I would do different next time is a little more sugar in the crust. Maybe the cookies I bought weren’t as sweet as they should be. I will definitely make this again. I have not. However, it should be fine to freeze after baking. Just be sure to thaw it in the refrigerator. 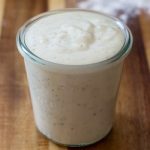 can this be made ahead and frozen back until Thanksgiving? It should be just fine. Just be sure to thaw it in the refrigerator. So excited to make this for Thanksgiving! If I make it a couple days in advance do I just keep it in the fridge? It should be fine kept at room temperature for several days. can i bake this in a regular pie dish? Absolutely, just be sure that it’s a bit deeper than a standard pie dish.